Spring has arrived. While it’s still too cold to open the windows, enjoying the sunshine through them is a springtime perk. Sparkling clean windows make it even better! Here at Cleantec, we offer professional window cleaning services to our commercial customers. 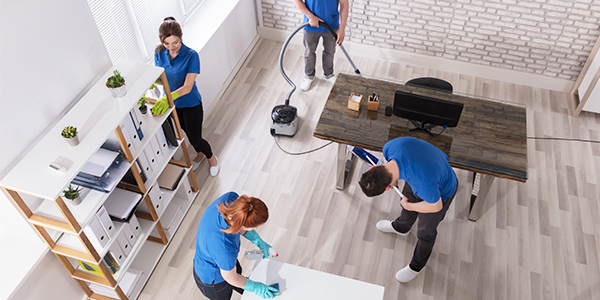 While we don’t offer this service for residential properties, we can certainly offer professional window cleaning tips! First things first – you need the appropriate equipment, starting with a bucket. Your bucket should be large enough to fit 1) a squeegee and 2) a mop-like cleaning tool. Other tools and materials you will need: a small scraper (perfect size for residential windows) to remove stubborn grime such as splattered paint, detergent, rags and a tool belt (for easy access to scraper and rags). Your squeegee is a magical tool, as it gets your glass clear and streak free in a fraction of the time it takes with paper towels. Invest in a good one with swivel capabilities if you are looking for streak-free sunshine all season long! Your mop-like cleaning tool should hold water allowing you to apply adequate solution to the windows. It’s also helpful if it has a scourer to help scrub away dirt and grime. Lastly, the handle should allow you to easily maneuver the tool over the entire window. Use a sudsy dish detergent to clean your windows. This will give you the lubrication needed to remove dirt, and will also highlight any stubborn water marks or debris left behind as you rinse them off. For your rags, use a micro-fiber cloth or old towel. Old T-shirts also work great for rags. Fill your bucket with cold water. Either add detergent to the water or apply directly to your cleaning tool. Use adequate water to clean the window starting at the top. If there are any stubborn spots, grab your scraper. 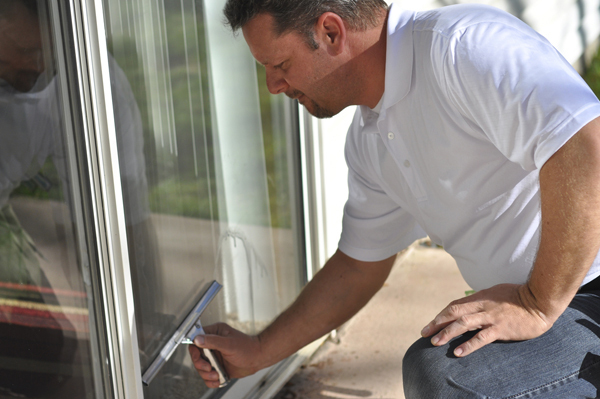 Make sure you do not scrape any stubborn debris over the glass leaving scratches. Always use a forward motion, pushing the debris then clean it off with a rag. Rinse the window and grab your squeegee. Keeping a constant pressure, start at the top and work your way down. Wipe any excess water away with your rags. If you need a step stool or ladder to reach second-story windows, remember to use them safely. Make sure the ladder’s feet work properly and have slip-resistant pads. Also look for a safe location with firm, level footing and rigid support for the top of the ladder. When using the ladder, use three points of contact – two feet and one hand or one foot and two hands. Learn more about ladder safety.